Art was always important in aborigines' life and you will soon recognize that when you are visiting Australia. There are various directions of aboriginal art, some of them are several thousand years old. The original works are rock arts, body painting and ground design dating back to 30.000 years ago. In addition the aborigines do dot and bark paintings as well as silk painting or wooden crafts for rituals, cultural ceremonies or music. Most of the used depictions base on the so-called ancestor's dreamings which date back to the making of the world - the 'creation'. The most important supernatural beings are the rainbow snake, the lightning man and wandjina - beings with fertility coming from the sky and the sea. Because of the various tribes it is difficult to inpretate the 'creation dreamings' with all its tellings, so that the meanings of the depictions are depending strongly on the area where the crafts were created. Rock arts have been developing in its appearance beginning with hand and grass prints followed by the naturalistic style which was dominated by long lines depicting humans and animals, sometimes filled with colours. Then the dynamic style began where movements were skillfully shown for example using dotted lines for flying spears. During this time the first mythological beings appeared. The next styles showed humans silhouettes and so-called yams figures, in which humans and animals were depicted in forms of yams (or vice versa!). In addition the 'X-ray style' was used. Animals and mainly fish were painted with bowls ans bones. 1000 years ago when the formerly salty marsh lands had become fresh water pools and flora and fauna had changed accordingly these changings were integrated in aborigines' art. 400 years ago even white humans were depicted, e.g. fishing men or Europeans as well as the things they brought with them like ships or horses. The most famous treasures of rock art are located in Arnhem Land in the tropical north of Australia, part of the Northern Territory. The meanings of rock art in Arnhem Land is markedly different from the ones in the central deserts where dreamings are taken strongly literally. Visitors can see the most impressive rock arts in Kakadu National Park at Ubirr Rock and Nourlangie Rock. In the Kimberleys depictions of Wandjina are most popular, while in Northern Queensland the so-called 'Quinkan spirits' Timara and Imjim are well known. They can be seen in the Quinkan galleries near Laura on Kap York peninsula. Holed log coffins were often used for burial ceremonies in Arnhem Land. In the western part they are called 'lorrkon', in the eastern part 'dupun'. They are usually decorated with figures of dreaming szenes. In the National Gallery in Canberra you can see 200 log coffins which were constructed in 1988 by a group of artists from Arnhem Land. The amount of 200 pieces represents each of the 200 years of European people settling in Australia. While the Eupopeans were celebrating the anniversary, the aborigines gave another contribution to the fight against injustices. aborigines Dot painting had its renaissance in the 70'ies and is today the most popular aboriginal art form. While the paintings were a kind of maps in former times representing specialties of landscape and vegetation they were later used for picturing dreaming journeys. Mainly paths or flights of animals or humans are depicted which are often representing ancestors. Objects are painted like they leave prints in the sand. I.e. an arc represents a person, an oval depicts a wooden carrying dish called 'coolamon', a single line depicts a digging stick and a circle is a fireplace. Men and women are depicted by the tools they use. Men by spears or boomerangs, women by digging sticks or coolamons. Concentric circles are dreaming places or locations where ancestors had a rest during their journey. Although these symbols are very common their real meaning is normally only known by the artist. Used colours represent the colours you will find in the outback, i.e. red, blue and purpur shades. Bark paintings are a more recent kind of aboriginal art, but they are an important part of the culture Arnhem Land's original inhabitants. The bark is taken from 'Eucalyptus tetradonta' during rain season when it is sufficiently moist and flexible. The outer layers are removed and then the bark is dried over the fire. After that it is smoothed out by weights on the ground so that it can be used after a few weeks. These days there are often sticks attached to the rims of the bark to keep it smooth. Even today the aborigines use natural colours like ochres, kaolin and charcoal guaranteeing a special appearance of the crafts. There are as well differences depending on the place of creation. In the western parts naturalistic pictures and uni coloured backgrounds are popular, while in the eastern parts geometric forms are more famous. An interesting aspect of contemporary paintings is created by aborigines who are effected by urban areas. Their art is strongly influenced by Europeans and was yet recently not accepted as being authentic aboriginal art. But times had changed and themes like racism and expropriation had become important symbols for the aboriginal fight for equal rights. 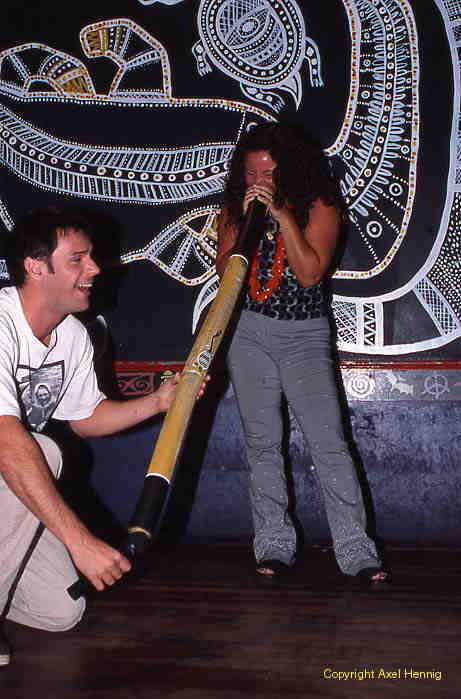 The most famous aboriginal artefacts may be dijeridus which were originally used as music instruments during ceremonies. They are produced from the branches of a special eucalypt tree holed by termites. The mouth piece is made of natural beeswax and the instrument is decorated with traditional symbols. So a visitor should acknowledge that most of the offered dijeridus never had been in contact with any aborigine and that they are far away from any authenticity. In addition the original pieces are often even cheaper than the fake ones which normally do not sound well and are just produce in order to get quick money. Another very famous piece of art is the wooden boomerang which was used for chasing as well as a clapping instrument during ceremonies. Against the common belief that boomerangs must be returning weapons, they normally were used to hit the chased animal. Most of the sold boomerangs cannot fly but are produced as decoration for your living room. There are many other wooden crafts and sculptures for ceremonies, sometimes with patterns which were burnt into the wood with scorching wire. In addition there exist various kinds of weapons like shields, spears or clubs mainly decorated with symbols of the ancestor's dreamings. Bags, baskets, garments or fishing nets are produced from fibres. In Utopia north of Alice Springs some aboriginal women are producing batik textiles. in Darwin was a funny event. When you buy authentic aboriginal art you preserve the continuance of the traditional art. But you have to take care, because there is a large amount of fake products which a visitor normally cannot distinguish from original pieces. That is true for any form of aboriginal crafts, so that you should buy your souvenirs in some of the galleries or shops run by aborigines or even buy directly things from some of the aboriginal communities who offer their works. Of course even there are differences in prices depending on how famous the artist is but in general you can say that many original crafts, especially dijeridus, are often cheaper than the fake products which are at least nothing else but coloured pieces of wood.